I found it practically impossible to watch A Most Wanted Man without constantly being aware that the man I was watching on the screen was dead and this was his last film. 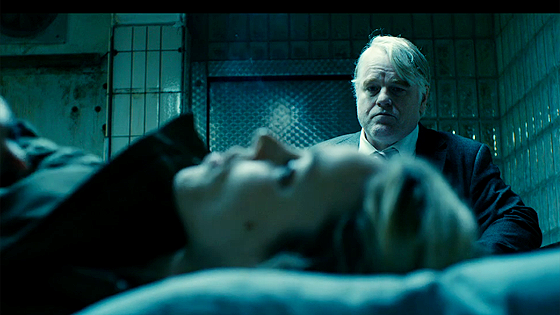 Philip Seymour Hoffman was one of Hollywood’s most unlikely stars and often one of the best things about the films he was in; this swansong, based on a John Le Carré novel, may not be one of the ones Hoffman will be most remembered for, but it is definitely a worthy final addition to his filmography. 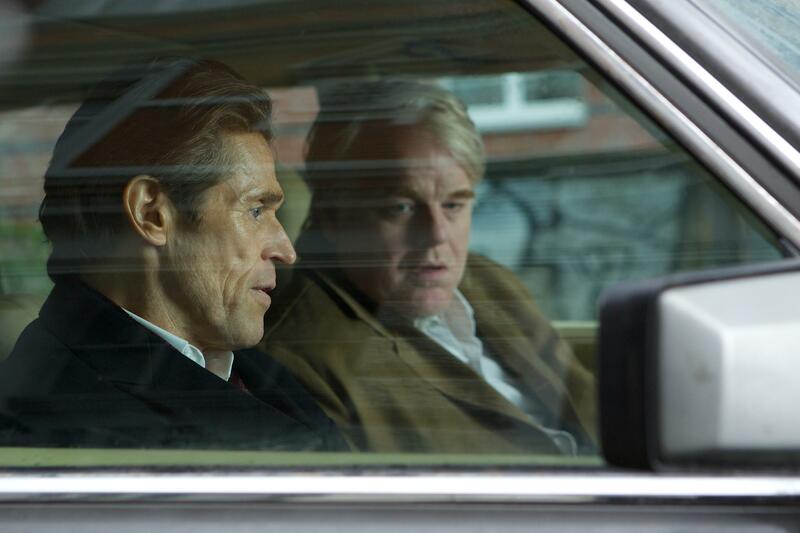 As with many of the films based on Le Carré’s works, A Most Wanted Man is not so much a spy thriller as a drama, with a distinct tendency towards tragedy. Hoffman plays a jaded German espionage operative keeping an eye on the Muslim community in Hamburg, and when a former Chechen radical enters his hunting grounds illegally he hopes to use him as an asset in his investigation of a Muslim philanthropist with possible ties to Al Qaeda. While the film doesn’t present us with as much of a quagmire of connections, motives and plots as a successful other recent Le Carré adaptation did – and Hoffman’s operative is a descendant in spirit of George Smiley – it is about similar themes. Years ago the Swiss magazine Du published an issue on John Le Carré titled “All Sorts of Betrayal”, and apparently this is still what the author keeps returning to. All of these betrayals, whether of friends, lovers, or of organisations and countries, are finally private at heart, and A Most Wanted Man sees its main character trying to weigh betrayals, to tempt, bully and cajole others to violate trust to prevent a bigger, more final betrayal. Except, of course, in Le Carré’s world there is no such thing as a lesser evil, and most definitely not one that can be trusted to end up being lesser. Even more, Hoffman’s body language, the way he looks at people and practices a studied cynicism, all these make it clear that A Most Wanted Man will not end happily for anyone. And this fatalism is in part why this is a good but not a great film: only in rare moments is there the urgency that comes from hoping, and even believing, that this may not end in tears. There is a grain of… faith in something other than jaded pragmatism, perhaps? Belief that even in espionage people, organisations and countries can still hold on to vestiges of a soul? And this belief keeps the main character going, but the tone of the film is as hangdog as Hoffman himself, though without his occasional sparks of hope and of righteous anger. As an audience, though, it’s difficult not to know better: this will end badly, so why commit emotionally? If anything, the film prompts us to be even more jaded than its protagonist, and this works against A Most Wanted Man. As may the real-life circumstances: Hoffman’s death hanging over the film may make it more poignant, but this poignancy is not in sync with the film. I was prompted to sadness, though not by Le Carré’s story so much as by knowing that this is the last time we’re seeing a lead performance by an actor gone too soon. A Most Wanted Man is a good film, it’s crafted beautifully, its performances are consistently strong, but its greatest tragedy may be that it serves most as a reminder of a different tragedy that has nothing to do with the film itself. Perhaps it will be easier to see it for itself in five to ten years, when it no longer feels quite as much like a obituary. I have to confess something – and not even under duress: I am not a big fan of John Le Carré’s Tinker Tailor Soldier Spy. I’ve got a copy of the novel at home, signed by the man himself (or was it David Cornwell? I forget…), since as a student I was part of a committee that invited him to do a reading at our department (and thereby hangs a tale for a different occasion). I’ve read the book twice and I’ve seen the BBC miniseries from the ’70s the same number of times – but while I enjoy the minutiae of Le Carré’s construct, Tinker Tailor Soldier Spy has always struck me as overly internalised, to such an extent that to me it came across as lacking urgency. There are definitely things about it – both novel and miniseries – that I liked, even a lot, first and foremost Alec Guinness’ George Smiley, but at least as much Ian Richardson’s Bill Haydon, but by and large I’ve found the whole thing too low-key an affair – and it takes a lot for me to find something too low-key and internalised. The recent film version of Tinker Tailor Soldier Spy works a lot better for me – though ironically the film probably wouldn’t have had the same effect on me if I hadn’t recently re-read and re-watched the novel and series. Tomas Alfredson’s adaptation is at least as good as the BBC effort in terms of its cast; there is no one in the film who isn’t cast and acted very well. It is also one of the most accomplished films of the last ten years in terms of production design, visualising the late days of the Cold War to perfection – and making the drab, dreary MI-6 of the time barely more appealing than its Russian counterpart, at least in immediately sensual terms. Alfredson’s film – and this will show me for the heretic that I am – is much better at bringing out the themes of betrayal and the human costs of living a life of secrecy, subterfuge and lies than the BBC miniseries, without losing the TV version’s subtlety. The film version transports its themes primarily through its acting and mis-en-scene, not through overly literal speeches or dialogues. I would go so far as to say it improves the book, making it more effective without sacrificing its strengths. Where the film steps wrong, at least in my opinion, is in how damn elliptic it is. It has trimmed any fat off the story, but in doing so it has cut very close to the bone. I like elliptic storytelling when done effectively, in fact I very much prefer it to storytelling that has multiple redundancies built in at every turn, something that tells the audience that it is certain not to overestimate their intelligence. Tinker Tailor Soldier Spy takes it further than is necessary or indeed helpful, I think: the plot comes across as complicated to the point of being obscure for the first hour or so, and only because Alfredson wants his audience to work in order to catch up. That’s fair, but the problem is that it tends to make the audience think that the plot is where it’s at, that you need to have an investigator’s – or a George Smiley’s – mind to understand what this is all about. This, however, is an unfortunate distraction: Le Carré’s story is strongest when it is about its characters, and the film version doubly so. The plot should tell us about the characters, not the other way around – and the more complicated the goings-on seem, the easier it is to miss what is important and interesting about Tinker…: how the world these characters inhabit and the betrayals, both small and large, they’re required to commit in the line of duty corrode their ability to be human. The film’s structure makes it seem like a whodunnit, when the solution is finally banal and rather simple, as well as practically dictated by the casting. This is one of the very, very few films that may in fact improve with a few minutes of audience guidance. Spell one or two things out for us, George, will you? And in return we can concentrate on you, and on Bill Haydon, and on Ricki Tarr, Peter Guillam, and on poor, poor Irina. The whodunnit can take care of itself.